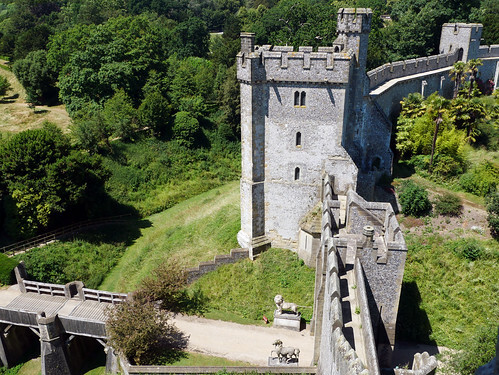 The oldest feature is the motte, an artificial mound, over 100 feet high from the dry moat, and constructed in 1068: followed by the gatehouse in 1070. Under his will, King Henry I (1068-1135) settled the Castle and lands in dower on his second wife, Adeliza of Louvain. Three years after his death she married William d’Albini II, who built the stone shell keep on the motte. 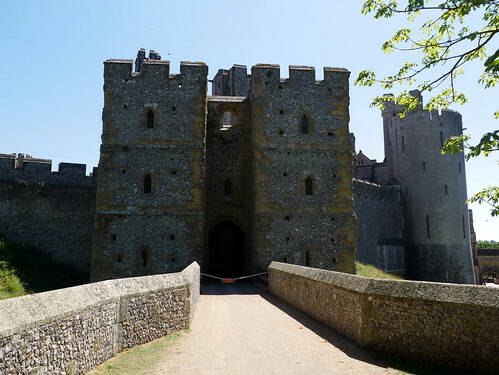 King Henry II (1133-89), who built much of the oldest part of the stone Castle, in 1155 confirmed William d’Albini II as Earl of Arundel, with the Honour and Castle of Arundel. 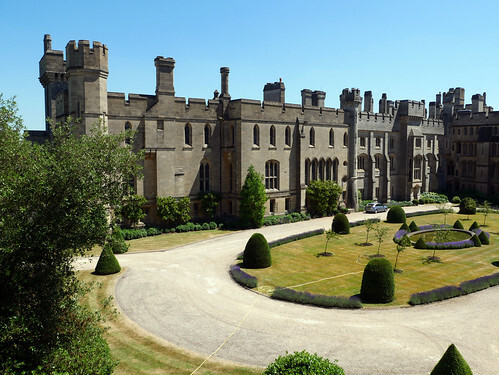 Apart from the occasional reversion to the Crown, Arundel Castle has descended directly from 1138 to the present day, carried by female heiresses from the d’Albinis to the Fitzalans in the 13th century and then from the Fitzalans to the Howards in the 16th century and it has been the seat of the Dukes of Norfolk and their ancestors for over 850 years. From the 15th to the 17th centuries the Howards were at the forefront of English history, from the Wars of the Roses, through the Tudor period to the Civil War. Among the famous members of the Howard family are the 2nd Duke of Norfolk (1443-1524), the victor of Flodden, Lord Howard of Effingham, who with Sir Francis Drake repelled the Armada in 1588, the Earl of Surrey, the Tudor poet and courtier, and the 3rd Duke of Norfolk (1473-1554), uncle of Anne Boleyn and Catherine Howard, both of whom became wives of King Henry VIII (1491-1547). These were politically dangerous times: the ‘Poet’ Earl was executed in 1547; his father, the 3rd Duke of Norfolk only escaped the death penalty because King Henry VIII died the night before the execution was due and the 4th Duke (1536-72) was beheaded for plotting to marry Mary Queen of Scots. There have been two cardinals and a saint in the Howard family; St Philip Howard, 13th Earl of Arundel (1557-95) died in the Tower of London for his faith. By contrast, his son, the ‘Collector’ 14th Earl (1585-1646), as his nickname suggests, was responsible for many of the treasures which can be seen today. 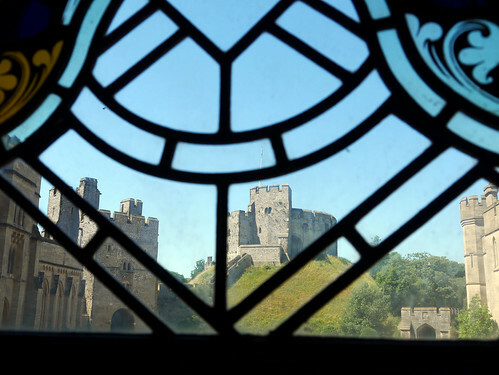 The results of all this history are concentrated at the Castle, which houses a fascinating collection of fine furniture dating from the 16th century, tapestries, clocks, and portraits by Van Dyck, Gainsborough, Mytens, Lawrence, Reynolds, Canaletto and others. Personal possessions of Mary, Queen of Scots and a selection of historical, religious and heraldic items from the Duke of Norfolk’s collection are also on display. 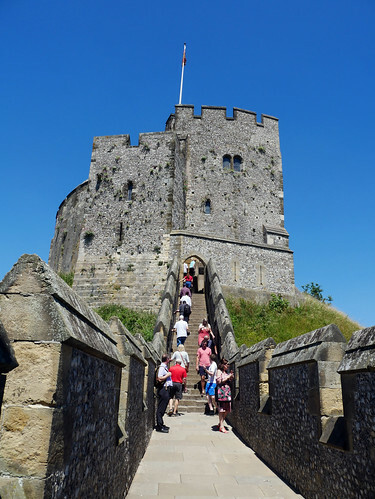 During the Civil War (1642-45), the Castle was badly damaged when it was twice besieged, first by Royalists who took control, then by Cromwell’s Parliamentarian force led by William Waller. Nothing was done to rectify the damage until about 1718 when Thomas, the 8th Duke of Norfolk (1683-1732) carried out some repairs. Charles Howard, the 11th Duke (1746-1815), known to posterity as the ‘Drunken Duke’ and friend of the Prince Regent subsequently carried out further restoration. Queen Victoria (1819-1901) came from Osborne House with her husband, Prince Albert, for three days in 1846, for which the bedroom and library furniture were specially commissioned and made by a leading London furniture designer. Her portrait by William Fowler was also specially commissioned by the 13th Duke in 1843. The building we see now owes much to Henry,15th Duke of Norfolk (1847-1917) and the restoration project was completed in 1900. It was one of the first English country houses to be fitted with electric light, integral fire fighting equipment, service lifts and central heating. The gravity fed domestic water supply also supplied the town. Electricity cost over £36,000 to install, but the splendidly carved chimneypiece in the Drawing Room only cost £150! It is a fabulous castle, well worth a visit. Yet another magnificent castle to see. I need another lifetime, Cherry! There is such a lot to see at this castle. That stunning blue sky is simply magnificent. 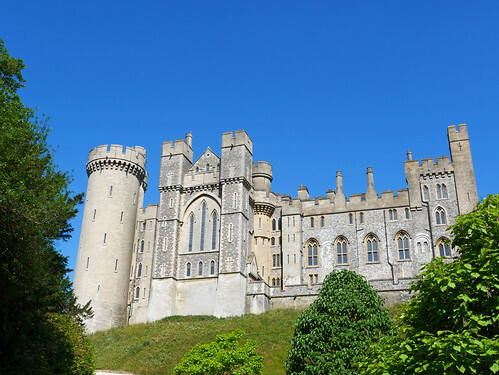 Arundel just has to be one of the best castles I have ever seen – it is amazing and your photos are lovely. Loved reading the history too. Somewhere else I now want to visit!!! You really should visit, it is one of the best castles I have visited. I haven’t shown you the interior, the gardens or the Catholic Chapel that is connected to the Parish Church. There is so much history of the place!